An endangered, grieving orca is still carrying her dead calf more than two weeks after the newborn died, CBS affiliate KIRO-TV reports. Researchers spotted the 20-year-old whale and the calf off of Washington's Olympic Peninsula on Wednesday, the station says. The calf died July 24 and images of the mother, also known as Tahlequah or J35, have struck the hearts of people worldwide. She has been carrying the calf with her for 16 straight days. "She literally is pushing her baby to connect with it and, hope against hope -- hoping that it will take a breath, which it will never do," biologist and wildlife conservationist Jeff Corwin told CBSN. "I can imagine this [mourning period] could take a very, very long time." Just like humans, Corwin said, grief has to "take its course." He said it would be "stressful" for experts to intervene in the whale's process, adding that J35 "probably is medically or physically healthy to survive." "I am sobbing. I can't believe she is still carrying her calf around," Giles told the Seattle Times. "I am gravely concerned for the health and mental wellbeing of J35." Michael Milstein, a spokesman with NOAA Fisheries, told KIRO-TV that researchers with Fisheries and Ocean Canada also spotted another member of the same pod Wednesday. 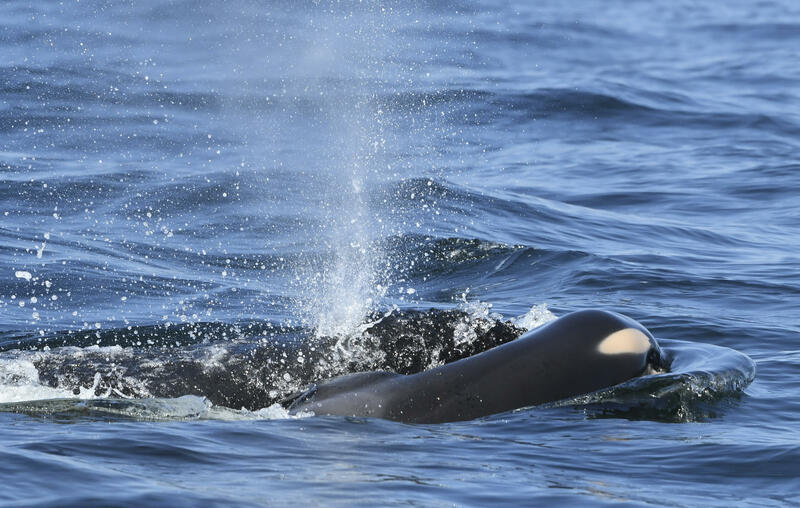 J50, the ailing 3 1/2-year-old orca, was seen along with her mother, J16. A team of experts have been searching for the young whale to assess her health and potentially give her food and medication, KIRO-TV reports. Last week, Washington Gov. Jay Inslee released a video statement on Facebook detailing what his office is doing to protect the orca population in the waters around the state. "This is something that has struck hearts all over the world," Inslee said. "In fact, who could not weep seeing this mother and the lost love of her child?" The recent, tragic death of the orca calf is heartbreaking and we all feel the pain of the mother and her pod. Protecting and restoring the food chain and complex ecosystem these beautiful animals rely on will take a combination of several immediate-term and long-term actions. There are no do-overs with the orcas. We must get this right. As of June 2018, the southern resident killer whale population -- the orcas found off the Puget Sound -- totals just 75 whales, according to the Center for Whale Research. While killer whales as a whole aren't threatened, the southern resident population is considered endangered under the Endangered Species Act, according to NOAA.